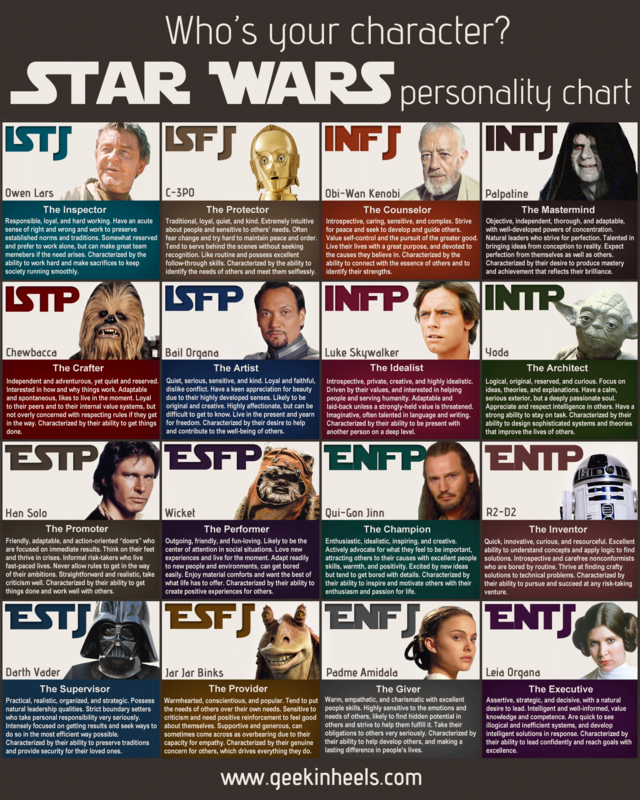 I recently learned that there is a Star Wars Personality Chart based off the Humanmetrics Jung Typology Test™. Does anybody remember taking this test in High School or college? I know I did. My high school councilor used it as a way to gage what careers we’d do well in. This is in no way a fool proof system and at the time I hated my councilor for making me take it. Of the 16 personality types I ended up being labeled as ISFJ – The Nurturer. I already knew I was an extreme introvert and didn’t need it to be pointed out to me, thank you very much. If we had the Star Wars Personality Chart to go off of back then, I think it would have enjoyed it more. Because I’m a geek and Star Wars is AWESOME. AND I would have been C-3PO. Who doesn’t love C-3PO??? Taking the test again now, much older and hopefully wiser, something odd happened. I ended up scoring on the other side of the spectrum. I am now a ENFJ – The Giver. Weird. I never really thought about how much I’ve changed in the last 14 years. I’ve always considered myself that same introvert of my childhood. How ya like them apples! So, which character are you?